I am Sabyasachi (Rahul) Bhattacharya, based in Melbourne, Australia and I play the sarod primarily in the style of the legendary Ustad Amjad Ali Khan, whose has been my original inspiration and teacher in my sarod journey. I have also imbibed external influences on my playing, primarily from the Imdadkhani/Etawah school of sitar playing. I commenced my musical training at the age of 5 , moving to advanced vocal training in the ancient city of Varanasi (Benares). I briefly trained in western classical guitar for a few years. I moved to the sarod in the early 90s, adapting my vocal training to the instrument. Recently, I have also sought training in the Shahjahanpur style of sarod via sitar virtuoso Pt Sugato Nag (senior disciple of Shahjahanpur doyen Pt. Buddhadeb Dasgupta) and also continue to receive guidance from sitar maestro Ustad Shahid Parvez. I believe that Hindustani Music is something to be experienced, not analysed. I call it a soul- soaking – I love music which allows me to close my eyes and allow my heart and soul to be drenched in the colour of the sound. My ideal musicians are Ustad Amir Khan, Ud Bade Ghulam Ali Khan, Ustad Vilayat Khan, Ustad Amjad Ali Khan and Ustad Shahid Parvez as their music displays a sense of balance – despite their tremendous technique, they use it only to enhance their musical poetry. I am acutely aware of the demands of concert playing on musicians. In a concert, people expect a spectacle – there is often the urge to dazzle the audience with technique – the complex tihai, the convoluted taan, the superfast jhaala – these, while pleasing, impress the mind but do not touch the heart. I also place great emphasis on the clarity of sound from instrumental musicians, in particular the sarod. It is only recently that the sarod sound has been refined from earlier styles of wooden, muffled rabab style playing. I am working to build up a vocal repertoire on the sarod . Vocal music is replete with masterpieces – take for example, the well known composition Eli Aali Piya Bina in Yaman – even the best instrumental compositions do not come close to the quality of this signature piece – why not play it on the sarod instead of settling for a lesser but more comfortable sarod composition? The problem with playing vocal music on the sarod is that it is exceedingly difficult. Thanks to Ustad Amjad Ali Khan and his innovative techniques we can now dream of even attempting such a composition on the sarod – previously this was unheard of. I can be contacted via email at info at sarod.com.au or by leaving a comment on this site. I have a question for you: I am sure you are familiar with the concept of “Yantrakaaku.” What I understand about it is this: Certain raaga-s shine better on, say, the sitar, than on the shehnai, etc. etc. For example, I have read an expert opinion that the raag Mia ki Malhar plays very well on the Sitar but Bhoopali sounds better on the bansuri. Now my question is: What are some raaga-s that might sound the best on the Sarod? I venture to suggest that Raag Shri is best suited for the Sarod. Also, Darbari Kanada. My list includes Gurjari Todi, Bilaskhani Todi and Malkauns. These are just intuitive ideas not based on any solid theory or deep understanding, I must confess in all humility. I would love to hear your thoughts on this. I know that at the level of greatness, a master player can transcend the limitations of Yantra Kaaku. Yet, Yantra Kaaku seems to really exist. Thanks for your time. I’m only slightly familiar with the concept of Yantrakaaku – there are related concepts such as swarakaaku, raagakaaku, desakaaku etc. I remember sitting in on a discussion with Dr. N.Rajam on the concept of Kaaku in general, as a practitioner, it struck me more as an obvious concept taking into account sound differences – and you are right that certain raagas have advantages/disadvantages on particular instruments. For example, it is only recently that Darbari is heard on the santoor or flute (I know of some old timers who walked out of a flute concert because the artist “dared” to play Darbari.). Malkauns has been dubbed an instrumental raag by singers such as Kishori Amonkar. As a practitioner, there are some operational considerations in choice of raaga to be played, including playing styles, string changes, repertoire of compositions etc. For a intermediate level artiste, the last factor is usually the deciding one. A senior artist may actually adapt a new raga to the instrument, as they have the capacity to do so. Once a certain amount of bandishes/gats are in circulation, the raga will be considered suitable to the instrument. Senior artistes who compose such bandishes take into account the tone, dynamic range and ease of playing when they compose their bandishes, and this can vary greatly for the same instrument (essentially they are introducing yantra kaaku). For example, Ustads Ali Akbar and Amjad Ali’s interpretation of the same raaga on the same instrument is totally different. The Imdadkhani and Maihar style of sitar vary considerably in their treatment of the same raaga. Transcending Yantrakaaku is subject to instrumental limitations, irrespective of how great an artiste is. For example, it will be extremely difficult to replicate a fast vocal tarana (say the one by Ustad Amir Khan in Hansadhwani) on the sarod. This is why we have sarod bandishes, sitar bandishes etc for the same raga. In terms of the sarod, given the history of the instrument, a large body of work exists for most ragas, including the ones you have mentioned. The instrument is also designed to execute the most common alankaars eg. meend, etc. My personal favourite instrument is the sarangi, as it mirrors the human voice like no other instrument can -And for me, vocal music is the final benchmark – all ragas start with vocal music and then come down to instruments. The functionality of the human voice in terms of sustain, texture and of course the ability to convey lyrics (hence meaning to the sound) is unmatched by instruments. Thank you so much for your edifying comments. I completely agree with you that the voice reigns supreme (Gala Baadshaa Hei–goes the Hindi adage) and I share your enthusiasm for the Sarangi as well. It has great ability to imitate the human voice. The animal skin and gut strings bring it closer to the voice. In defense of the Sarod and the Sarangi, I would pose the following argument: Although the human voice has all the primordial elements that go into the making of the Sitar and the Sarod, it does not have a direct metallic component. So, while the human made Veena (Sarod, Sitar, etc.) is inferior to the Gaatra Veena created by the Great Cosmic Musician/Craftsman, but it has a quality that the voice cannot fully create. Sarod has that even more because of the fingerboard plate. 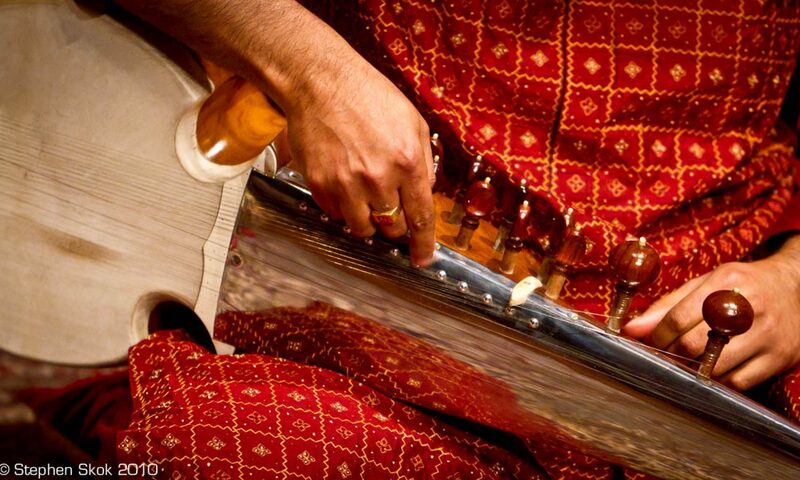 There is a poignancy and clarity that results from the complex interaction of wood,metal, and animal skin (and the human fingers) in the Sarod that in some sense lifts it up to the level of the human voice through the rich harmonics created in the process. No wonder the Vedic Texts use the phrase Veenaa-Venu-Mrdanga while talking of sacred music. The human voice is made complete with the contributions of these instruments. Thank you for this beautiful forum. I am Upasana Parasrampuria from Mumbai, India. I have been enchanted by the sound of the Sarod every since I heard a concert of Ustad Amjad Ali Khan in Mumbai and am very very keen on learning how to play the Sarod. But I am unable to find any teacher who can help me. I have been trying to find a teacher for Sarod lessons here in Mumbai but in vain. It would be very helpful and appreciated if you could direct me to someone who can teach me how to play the Sarod. Thank you for your interest in the sarod. As you are in India, you should have little difficulty in locating a teacher. I will email you separately with details of sarod teachers in Mumbai. Can you please help me with the details of Sarod teachers in Mumbai as well. I am deeply interested in learning this beautiful instrument. I know I am a bit late to join this forum as this discussion happened 4 years back. Google suggested me this page while I was trying to find Sarod teachers in Mumbai. Could you please help me with this. I am really interested in learning and buying the instrument. I am based in Mumbai please suggest me some good teachers. And from where should i buy sarod in mumbai? Hello Rahul, if it’s not too much trouble, could you email a list of Sarod Teachers in Mumbai to me as well. Hey Sabyasachi – how are you? Quick refresher – we were together in IIT DElhi and then for a few weeks at Philips in Mumbai. would be great to get in touch again. Can you please help me with the details of Sarod teachers in Mumbai as well. I am deeply interested in learning the instrument. Hi Rahul, Thanks for your quick reply would like to ask you one more thing,do you think if i learn to play the sitar first would it in anyways help me to learn the sarod afterwards as i believe it is more difficult to play the sarod,my passion is to play the sarod one day and i am totally a novice in the musical word i will have to start from scratch,and also how is the sharada sangeet vidyalaya in bandra east for learning as my office is very close to it and it would be very convenient for me to go there and take my classes for playing the sitar after office hours. Please Advice and any suggestions or comments that you would like to give me. It’s fine to start off with the sitar, and as the school is close to work, it’ll help maintain regularity. The key thing is to start your musical journey ! It’s very encouraging and interesting to know about your profile and particularly Sarod playing , I am also Learning Sarod and Enjoy Gayaki Ang on it (Try to but difficult). thanks for sharing your experience with us. Thanks Mukesh- what style are you following? Gayaki ang playing is technically similar to playing Ekhara (see Ustad Amjad Ali’s video on Youtube), but you are right -it’s hard to get the right emotional content in the playing. Will you please mail me the list for sarod teachers in Mumbai/Pune ? Hello Yogesh, I know of Shri Brij Narayan and Pradeep Barot. Both are in the Maihar (Ustad Ali Akbar Khan style). I am not aware of any Amjad Ali or Shahjahanpur style sarodiyas in Mumbai, although it is highly likely that there are practising sarodiyas of either gharanas resident in Mumbai. DEAR RAHUL, I AM VERY INTERESTED IN CASSICAL MUSIC OF INDIA. AND I LIKE SAROD AND SITAR MUSIC. PLEASE TELL ME IN BETWEEN SITAR AND SAOD WHICH IS MORE SUTABLE FOR PLAYING INDIAN CLASSICAL MUSIC? ALSO TELL ME MERITS AND DEMERITS OF THE INSTRUMENT. Hello there, both are equally suitable and specifically developed for this type of music. These instruments only have merits – no demerits that I can think of, so take your pick ! thank you rahul. please give me some advice to start sarod. Its a delightful accident that I got to this forum while looking for someone to teach me Sarod. I deeply appreciate your reverence for the instrument. I would like to learn Sarod once I go back to India after finishing my studies here in Germany and for that if you know some teachers in Pune could you kindly mail me their contact details. Dear Rahul, many thanks for the reply. I would surely try to contact Ustad Shahid Parvez and find a teacher in Pune. Meanwhile, I also got in touch with Pt. Brij Narayan from Mumbai and he also agreed to coach me, so looking forward to meeting him as well. Thanks again and all the best. what a great idea to create this forum ! I recently bought a sarod from Rikhi Ram in Delhi ( I play guitar and I love indian classical music ). Do you know any sarod teacher in Delhi and Varanasi ? I will spend some time in Rishikesh and Dharamsala as well. I see you bought a sarod from Rikhi Ram in Delhi. Would you be able to tell me which style you bought and if you are pleased with the quality of sound and manufacture? A friend of mine, a concert guitarist, is wanting to purchase a sarod and would appreciate some advice from someone like yourself who has experience in purchasing. Firstly, my heartiest appreciation and congratulation to you for doing such a wonderful work in the field of Indian classical music. My name is Sudhir Kotecha and I live in London. I am a 64 year old Science and Maths teacher by profession. I have been playing north indian style violin since I was 15 and recently bought a sarod as I love the sound and tonal quality of sarod. I downloaded your pdf document which is a great help. However, I would appreciate if you let me know as to how I can access the videos that are mentioned in your document. I would be willing to incur any costs that is required. I will appreciate your assistance and hope hear from you soon. I’m Aditya from Kolkata. My elder sister used to play Sarod and she learnt it for more than 10 years under the tutelage of Gurujis (of Maihar gharana) and guidance of my father who was an ardent fan of Indian Classical music and was himself a tabla player. However, things changed drastically when we lost our father in ’99, when I was in 9th standard. The journey of life since then has been tumultuous. My sister is now married and no longer in touch with Sarod. 2. As I’m a working professional, time is indeed a constraint. However, I should be able to manage 1.5 to 2hrs a day for riyaaz. But I’m not sure if that will suffice, because I had seen my sister riyaaz for a minimum of 7-8 hrs a day! Considering the constraints, do you honestly think I can go forward with my ‘ambitious’ decision? 3. Would you like to recommend any Kolkata-based Guruji (preferably from Maihar gharana) or any teaching institution for me, who would like to teach a grown-up novice like me the basics of sarod? (The Gurujis who taught my sister are no more with us). Eagerly waiting for your response and valued suggestions. Thanks. Hello Aditya – good to hear from you. It’s never late to start anything – if you’re passionate, you’ll find a way. Re: riyaaz time, it depends on what you want to achieve. If you want to be a professional sarodiya, then you will need a full day. However, if you want to play for yourself, then that’s a different matter. Re: Maihar, I would certainly recommend Shri Tejendra Narayan Majumdar, whose music I’ve come to appreciate over the years. I do not know him personally, but contact him anyway and see what he says. All the best. Thank you so much Rahul Ji for your encouragement and valued opinion. Music is indeed Divinity and pusuit of it is Saadhna, wherein one needs to go through several stages before reaching a stage where one doesn’t only play the music but Becomes the Music. Only a lucky few achieves this in a lifetime. Considering my limitations, I know I have little realistic chance of making a mark as a professional sarodiya, but that shouldn’t deter me from pursuing my passion for sarod, and music in general. I may not be able to meet God in my lifetime, but it doesn’t stop me from worshiping, does it? As far as Shri Tejendra Narayan Majumdar is concerned, I’m not sure if a maestro of his calibre would want to teach a grown-up beginner like me. But it’s worth a try, I reckon. However, if you have any alternative recommendations, please let me know. Hello Aditya – do try Tejendra da- if not himself, he’ll be able to recommend someone I’m sure. Remember, if you never ask, you’ll never know. I have learnt some basics of sarod and would like to pursue it further. Can you kindly tell me a good sarod teacher in Pune? Also I would like to know your thoughts on how to do the riyaaz! I AM VERY HAPPY YOU PLAYING SAROD AND LIVE IN MELBOURNE . SIR I WANT SOME HELP AND I WANT TO MEET YOU REGARDING MY SON AND I AM ALSO LIVING IN MELBOURNE. PLEASE GIVE ME TIME. Do you know any sarod teacher in pune? I am deeply interested in learning the instrument. I have been taught Sarod under Anupam Joshi Ji Pune who is a desciple of Pt Taranath Ji. Just a few months since have started the training. I am interested to buy your book kindly let me know how can i buy it. How do I purchase your book? How does the indian culture use it ? When is the sarod used ? is it used it festivals, celebrations ? whats their main reason to even play the sarod ? I am a classical guitar major at the Jacobs School of Music at Indiana University. I just finished a one week course on Indian Classical Music taught be Amjad Ali Khan and Ayaan Ali Khan. Ever since the course ended i have been searching the web for teachers near by and how to purchase a sarod. If you have any insight on how I can accomplish these things please let me know. Hope this helps. I’m travelling in Europe at the moment, can send further details if you have more questions…back in mid October. Hello sire, i’m glad I bumped into this site and forum. I took time to see how carefully and promptly you write back. I’m hence posing my question to you. I’m a guitar player, playing metal/rock music for a while. I have a deep fascination for Indian classical music and took a few classes from a Flute Player (Smt Padma Tai Talwalkar’s disciple) to understand Indian Classical Music in brief. I figured that although there are some guitar players (John McLaughlin, Prasanna, Mattias Eklundh and many more) who actually play good Indian Classical music, I felt the need to have a fretless instrument to really understand, appreciate and play Indian Classical Music. I like the tone of it, it sounds very close to maybe a sarod with the warmth of an acoustic guitar. Do you think I should pursue learning Indian Classical music on the fretless guitar? Do you think it would help learning from a “Sarod” teacher more than a Flute player or a vocalist? What are your views on this? Hello Amar, I’ll send you some thoughts when I’m back…as I’m traveling at the moment. .
I’d like to buy « the sarod book ». However, I don’t see any section allowing me to order the book. could you please tell me how I can possibly your book. Can you please tell me the best place in Mumbai and Pune to purchase a Sarod. I am buying on behalf of a friend, a professional musician in Spain, who has great interest in playing a Sarod. He requires a well-made, high quality instrument. I would appreciate any information on the best place to buy, what to look for in a good quality instrument, and an approximate cost he can expect to pay. I will be in Mumbai and Pune in January 2014. With thanks. Hi Rahulji, i have been learning sarod on and off past 2-3 years because of lots of constraints. I am working in Mumbai would appreciate any suggestions from you in order for me to restart Sarod learning. What i can do is…….i can hold the instrument very comfortably, can play a very small gat 5-6 lines in total very nicely (meaning i like my own sound when i play it without stop and thts what i have been doing it regularly 10-15 min max ,as an excercise ), in general can locate most of the swars. is there any sarod teacher in delhi? i am willing to travel to delhi to learn the sarod but i dot thik i can come all the way to australia. There are plenty of sarod teachers in Delhi …also in the US, Europe etc. I’m pretty sure you will find one closer to you than have to travel to Australia. Then there’s always the Skype option, but one on one in person is the best way to go. i am 26 years old. i am from kolkata. i love the sound of sarod. it makes me mad. i always think that if i could play it. i don’t want to learn sarod for fame. i just want to learn sarod for myself. i think music is the only way to reach god. many times i start crying while i listen to sarod. i don’t know why. i always wanted to learn sarod. our family conditions didn’t allowed it. now i am a school teacher. i want to know that wheter it is possible to learn sarod at my age or not. please reply me. i am waiting for your precious suggestions. I only saw this post today and got intrigued. By any chance , will you still email the details of sarod teachers in Mumbai? I recently moved Here and have been looking for a teacher ever since. Hello Surabhi, sorry for the late replay – your comment was flagged as spam by my website filters… you can try Pt Brijnarayan (of Maihar style). However, I’m not aware of many Amjad Ali or Shahjahanpur style sarodiyas in Mumbai…I’m sure they are around…. I am Isha from Mumbai, India. I am a learner of Hindustani Classical Music and my Riaz is that of a vocalist for now. However, I am planning to join the Santoor because of its beautiful & meditative nature of sound. The confusion though is that i am very much appealed by the sarod as well. Aiming to be a professional artist, my heart doesn’t feel content on one instrument. I have attentively heard instruments played in the Hindustani style ranging from the flute to the violin. I wish to be a multi-instrumentalist. My teachers have supported my decision of taking instrumentals along with vocal. But I am extremely confused as to which instruments I might learn and in which order? I feel that the main part of our Classical music is the understanding of the minutely detailed musical system & concepts and being able to creatively utilise those while we play or sing (having a good hold on the taal is obvioisly included). I plan to learn with all my heart the Santoor, the Slide guitar & the Sarod apart from Vocals. Could you tell me your opinion about it? Could you tell me in what order shall I move forward? I don’t feel that it is impossible. And I am more than ready to work as hard as possible for it. There is a strong urge to learn all that is possible. I wish to know what a Musician like you might say on such a topic? Please offer your precious guidance! And also, please suggest some good places to learn the sarod as I could not locate any in Mumbai. Thank You! Hello Isha, thanks for your email. At the outset, there is no right or wrong approach to learning any instrument. I’d suggest that if you wanted to learn an instrument, you need to decide what music you want to produce from it. For example, if you are interested in closely matching vocals (or putting your vocal training into instrumental execution) then you need an instrument which does meends/gamaks/murkis easily. That narrows down the field somewhat to sarod/sitar/sarangi etc. On the other hand if you really want to enjoy the unique sound of each instrument, then you can go in any order you wish. The other question is the level you wish to attain in each instrument. If you just want the ability to play something basic on each instrument then that’s ok, because each of these require a lifetime of practice to get to a decent level. (That’s why you don’t find multi-instrumentalists).Your constraints will be time – trying to cover all these instruments is going to be tough. Remember that in our traditional instruments (sitar, sarod, sarangi, tabla) – hundreds of maestros over several generations have worked to build up a body of work – and in each instrument, there are various styles of playing (for example, in sarod, there are three approaches to playing, which differ significantly in their approach).In terms of sarod in Mumbai, I know of Pt Brij Narayan of Maihar style. I am sure there are others. Yes, I recently saw Pt. Brij Narayan’s website. Thank you so much for your response. It was very kind of you to offer your guidance and views. It was very helpful. Thank you so much. Calcutta, and I am told that there aren’t many here who teach the Amjad Ali Khan style, which will always be my principal choice. Should I, then, go on to start with the Pt. Buddhadeb Dasgupta style? Also, I have difficulties in sitting in Ustadji’s posture, not being supple enough. Will sitting in a common cross-legged fashion on the floor hinder my playing? I thank you for your time, and once again, for this splendid site. P.S- If I may ask, at what age did you start learning the sarod? How late is 25? Hello Soham, thanks for your note – there are quite a few sarodiyas in the Ustad Amjad AK style in Kolkata – you can certainly approach Shri Debojyoti Bose (Tony da) who is a senior disciple of Ustadji. Re: sitting etc, I can say that all roadblocks will disappear if you persist. I started the sarod in my late teens. 25 is not too late. It’s NEVER too late ! Hello Lutchmi, there are very good sarod players out there… I personally look for those with their own style (not simply copying their teachers) who demonstrate a deep dive and independent thought about the raga being rendered with clean sound as my prerequisites. Without a doubt, the three maestros who have pioneered the modern sarod remain Ustad Amjad Ali Khan, the late Ustad Ali Akbar Khan and Pandit Buddadeb Dasgupta (a brilliant mind, as well as possibly the most prolific teacher of modern sarod in terms of output of capable students). Ustad Amjad Ali Khan (my guru) in particular pioneered the clean sound that defines modern sarod. One should listen to all three of them, especially in their prime. Of current sarod players, I find interest in Pt Tejendra Narayan Majumdar (new thought into an older style) and sometimes Prattyush Banerjee (different approach to sound). There are some younger players but their output is not very mature, but they have enormous potential, so hopefully with time, they’ll get there too. Greetings. I have a Sarod for sale and am wondering if you may know of anyone who might be interested. I am in Glen Iris Melbourne. It is an Ustad Ali Akbar Khan style Sarod and it has marked on it, that it came from Calcutta but i purchased in Delhi four years ago. Do you have an sarod’s for sale in Australia. My name is Yadnesh presently located in Goa. Please help me to find a Sarod teacher in Goa and where to buy a good sarod (Ustad Amjad Ali style). I am new to Musical instrument / sarod please suggest me CD for beginner starting from ABCD of sarod. I am very passionate to learn sarod. I am from Delhi and I have been learning classical music vocal for a few years. I have spent time with a few raags, can identify notes and copy my teacher. Lately I have been bogged down by frequent respiratory problems. I am considering learning an instrument so that I can continue with my lessons and have the option of switching to the instrument if my problems persist. Can you suggest teachers who can get me started on the sarod or sarangi so that I can continue with my vocals teacher? Do you think the violin is as good an option as the sarod? Please help me with the details of Sarod teachers in Mumbai near Chembur area. I am interested in learning this beautiful instrument. Pls try Shri Brij Narayan – Maihar style sarod player. I’m not sure where he is based – whether he is near Chembur or not. I am from Mumbai. Could you please share the details of sarode players based in Mumbai? I don’t have any background in music although I have been listening to Hindustani Classical music for last ten years. I have heard the names of Pandit Pradeep Barot or Pandit Brij Narayan although I could not manage to get their contact details. So I am quite worried whether any teacher would be willing to teach from the scratch.I am a PhD student in astrophysics. I would be grateful if you share the details of sarode teachers you know and also give suggestions( as I would not be able to concentrate too much on sarode). I am interesting in Sarod classes for my daughter. Could you please send me your classes schedule and location where you have classes in Melbourne? I’m Phani krishna from Hyderabad. I just started learning hindustani on fretless guitar under a sitar teacher. I’m struck between the STANDARD GUITAR tuning(E,B,G,D,A,E ) and SAROD TUNING (SA,PA,SA,MA)…. Is there any factor that makes the SAROD tuning more better or comfortable for playing hindustani..? I’m totally confused about this tuning.I read you have played guitar, so i would be very thankful to you if you could shed some light.